Well done to all involved on the Saturday big clean up. 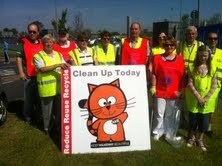 This entry was posted in Anti litter, Clean Ups, Kilkenny City, News and tagged cats, clean up, Lions by KKB. Bookmark the permalink.